New Kensington Community Development Corporation (NKCDC) received a two-year, $150,000 grant from The Kresge Foundation to support its trauma-informed community development work in Kensington. NKCDC’s executive director, Felix Torres-Colon, described it as a break-through grant for the organization. Torres-Colon was grateful that the Kresge Foundation recognizes the connection between housing and health and honored to be among the first recipients of this award. “Understanding traumatic stress, resilience and healing already has transformed the way NKCDC works in Kensington, and these new tools are giving our community a new way to see itself,” he added. NKCDC was one of 13 organizations chosen by Kresge’s Advancing Health Equity through Housing Initiative. Nonprofits and local government agencies were the first grantee group to receive this award. Kresge knows that housing is paramount for individuals and families to achieve well-being and economic stability. The foundation is investing in organizations that are creating positive change in cities and neighborhoods nationwide. 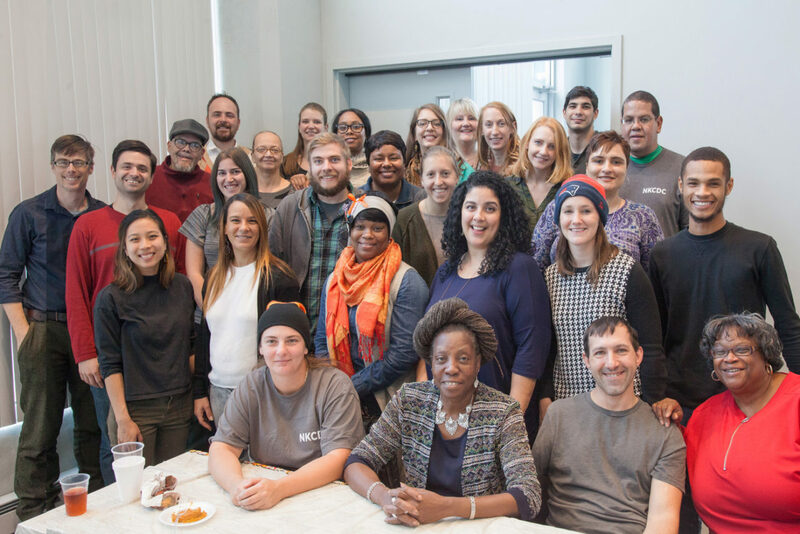 “Our intention with the Kresge grant is to take our learnings from attending the Sanctuary Institute (a training center for trauma-informed care) and our long and fruitful process of exploring a healing-centered approach in the Kensington community and apply it to the work we do to mitigate housing instability,” said Tess Donie, NKCDC associate director of community engagement. Hire resident leaders trained in the concepts of trauma-informed care. Use cross-learning between our trauma-informed community leaders and staff in NKCDC’s Housing Services and Community Engagement departments. Create new pipelines for increasing access to housing services and home repairs. Incorporate trauma-informed care into Housing Services. Utilize new engagement practices with our trauma-informed community leaders to increase access to services in Kensington. Community engagement director Andrew Goodman agreed with Torres-Colon and Donie. “We are thrilled to be part of the Kresge network, and even more thrilled to bring needed resources to our staff and residents,” he said. NKCDC has been working in the Fishtown, Port Richmond and Kensington neighbors for over 30 years. “We are one of the oldest and largest CDCs in Philadelphia, with programs spanning housing services, economic development, real estate development and community engagement,” Lowell Brown, interim director of resource development, told us. In 1996, in partnership with the Pennsylvania Horticultural Society (PHS), NKCDC became the region’s first organization to use vacant land management as a strategy for neighborhood revitalization. “In recognition of our work to clean and maintain hundreds of vacant lots, NKCDC received a Best Practices Award from the U.S. Department of Housing and Urban Development, and the City of Philadelphia adopted our model through the PHS LandCare Program,” said Brown. In 2001, NKCDC became Philadelphia’s only member of NeighborWorks America, a congressionally-funded network of more than 240 community development organizations across the country. NKCDC became the first organization to complete a multi-use funding initiative through a Pennsylvania Housing Finance Agency’s pilot program in 2005. “That year, NKCDC also completed the first home repair project under the City of Philadelphia’s Targeted Basic System Repair Program. Coral Street Arts House, a 2005 redevelopment of an abandoned textile mill in East Kensington, became the region’s first project to combine low-income housing with artist live-work space, winning a Grand Jury Award from the Philadelphia Preservation Alliance,” he added. With the completion of the North of Lehigh Neighborhood Revitalization Plan in 2013, NKCDC shifted its primary focus from Fishtown to Kensington, completing the $17.8 million Orinoka Civic House redevelopment of a former textile factory in 2017, and renting its 51 affordably-priced apartments. Today, NKCDC offers housing services to all Philadelphia residents; maintains more than 900 vacant parcels throughout North Philadelphia; and provides small business resources, neighborhood planning, leadership development and community support across the Kensington, Fishtown and Port Richmond neighborhoods. Brown said that they serve a community of more than 20,000 low- and moderate-income families and 60,000 residents.